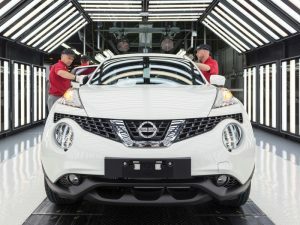 2017 UK car manufacturing declined by 3%, reinforcing the need for urgent clarity on the transitional arrangements for Brexit according to the Society of Motor Manufacturers and Traders (SMMT). More than 10% of exports could be at risk unless current trading arrangements are maintained. SMMT data shows 1.67m cars were built in the UK in 2017, marking the first decline in eight years. The downturn follows a 9.8% drop in production for domestic demand, attributed by the SMMT to declining business and economic confidence and confusion over the Government’s policy on diesel. Exports also fell, but at a much lower rate of 1.1%. Overseas demand continued to dominate production, accounting for 79.9% of all UK car output – the highest proportion for five years. In response, the SMMT restated the need for urgent clarity on Brexit transition, as new calculations show over 10% of exports could be at risk unless current trade arrangements are secured. The SMMT also released new figures showing that UK automotive investment fell by 33.7% in 2017. Some £1.1bn of investment earmarked for vehicle and supply chain manufacturing was publicly announced last year, down from £1.66bn in 2016.